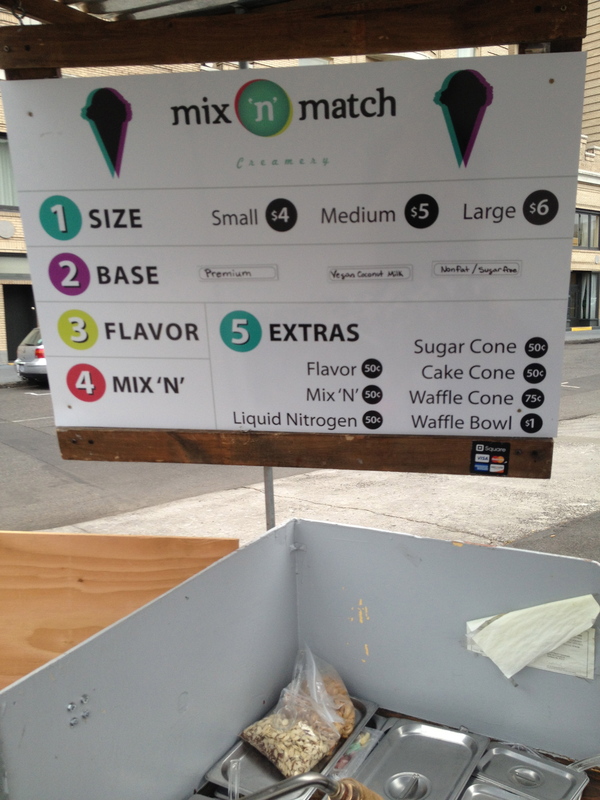 One of my more recent adventures involved a Friday evening trek down to Mix ‘N’ Match Creamery a food cart over near Voodoo Donuts. After Yelp-ing nitrogen ice cream this was the closest place that came up. I almost gave up on finding it – instead of being a full food cart, it’s literally just a small cart. Friday was a bit of a darker, more cloudy day than most have been in the past month. 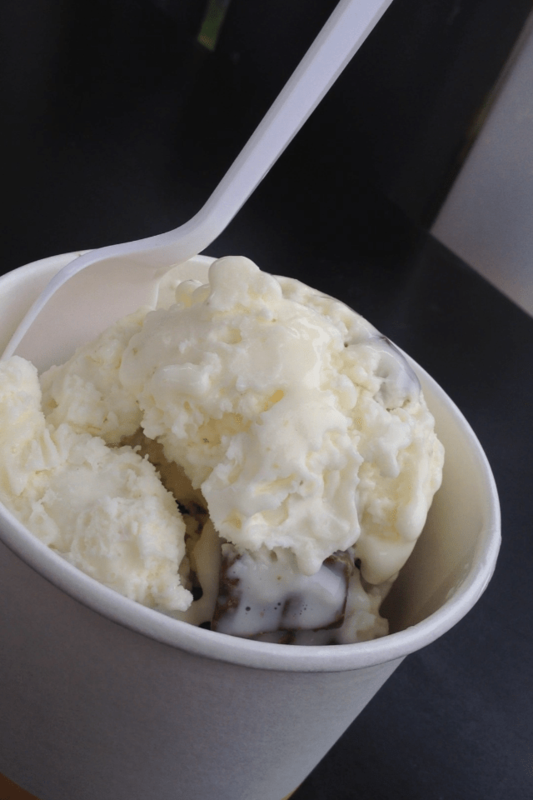 I approached the cart, and young man working there – Kyle, he later said his name was – asked if I wanted some ice cream. I browsed the expansive list of flavors and ingredients. 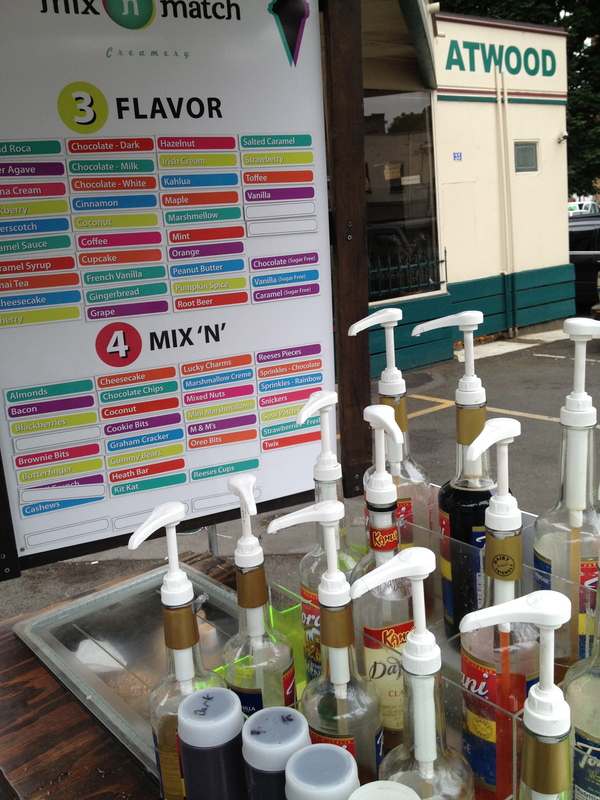 These are all the flavors and add-ins they have available! Finally, I decided on peanut butter flavor, and kit-kat as an add-in. While chatting with me, Kyle mixed up all the ingredients, and set them under the nitrogen. A smoke rose from the cream mixture as he continued to stir. Another blast from the nitrogen and it was ready to serve. The ice cream was good. I would have liked it to be a little bit more peanut butter-y and stay frozen longer, but those are just little things. I would definitely go again, especially with visiting friends, because it’s pretty fun. Right by Big Pink (Portland City Grill) and Voodoo Donuts, so why not? Grab a snack after happy hour and before getting in line! I have not heard of this “nitrogen ice cream” of which you speak (or write). How is it different than ice cream with mix-ins someplace like Coldstone? As described above, they make it right in front of you! 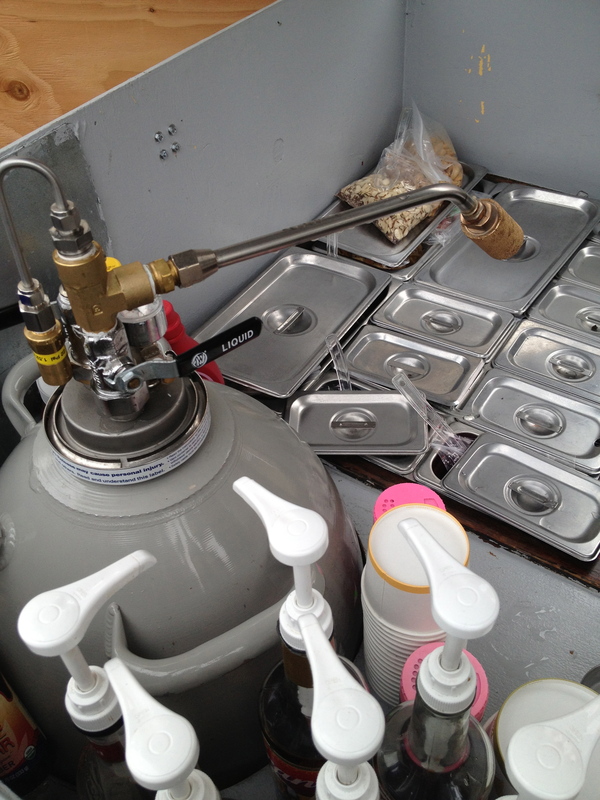 It’s a cream base that they mix whatever flavors you desire, then they freeze it with the nitrogen! This entry was posted on August 6, 2013 by Nathanial in Adventures!.